"We are de-institutionalizing orphan care," our local Children's Officer told us. "Some orphans have to live in an institution; there are kids who have nowhere else to go. But it is a last resort. There will be no new orphanages of any kind in this county." She explained to us that many times, relatives send kids to live in orphanages so that they don't have to take care of them. Maybe they don't want the trouble, maybe they feel they can't afford it. Ministries like the Community MKKs (MKKs who live with their relatives, and we help with school fees and sometimes other expenses on a case-by-case basis) are very important because they help keep orphans with their relatives, and that is the goal. The landscape has changed since we arrived in Kenya in 2012. When we first began presenting our idea for Maisha Kamili Children's Homes, which would be small group homes, we were told, "That's a great idea. No one is doing that in this area. We support this model." It was encouraging and exciting. However, as we've been working on acquiring land where we can build these homes, things have changed. There is too much fraud, too much abuse, and even in the best case institution scenario, it is still better for a child to grow up in a family than in an institution. Kenya doesn't want any more institutional orphan care. We have – and will continue – Community MKKs and Transitioning MKKs, but there is a component missing. There are MKKs who live with aging grandmothers. Their other relatives aren't willing to take them in. When their grandmothers die, what will become of them? We have nowhere to put them without the Children's Homes. There are also kids today who would qualify to be Community MKKs if they had a relative to live with and apply for help. But they have no one and are on their own. We came to Kenya believing that we would be building children's homes – not large, dormitory style orphanages, but institutional orphan care nonetheless. We named this organization Maisha Kamili (Swahili for full life) because we don't want to minister to only one aspect of the lives of orphans – only school, only food, only medical. We want to be an instrument to bring them the fullness of life that Jesus offers, ministering to their physical, educational, emotional, and spiritual needs. We thought that children's homes was the best way to do that. But is there an even better way? 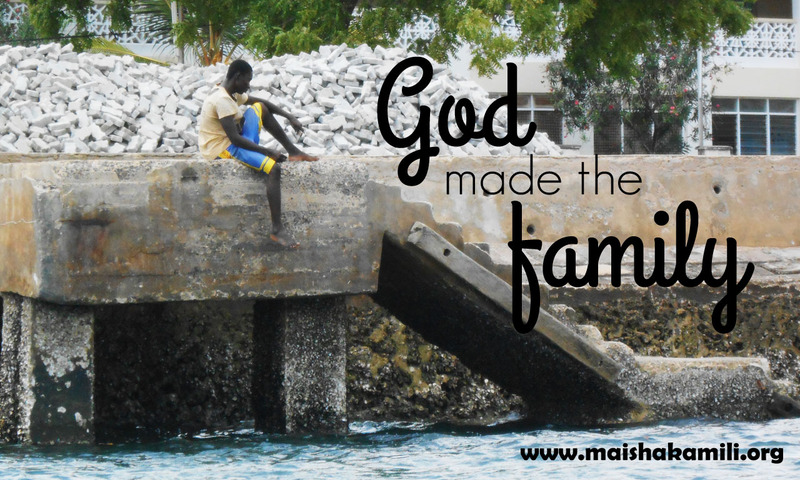 "Man made orphanages for children, but God made the family for children." Maisha Kamili Kenya has been a society in Kenya, but we are transitioning our registration to something called a Community Based Organization. This is an effort between an organization and members of the community. For example, right now we provide school fees for our CMKKs. Their relatives provide for other needs like housing and food and discipline. It's a group effort. Orphans who don't have relatives to live with need foster families. There is foster care in Kenya, but not many participants. We are not a foster agent. But we can encourage fostering, help organize training or interest meetings, provide moral (not financial) support to foster parents. It's scary to venture into this. If we were building children's homes, we would only have to raise funds, build the homes, hire house parents, and recruit sponsors for each child in the home. Encouraging couples to become foster parents is even more out of our control than fundraising. Taking into your home a child who is not your own is counter-cultural, even in the US where orphan care is trending. We have already seen godly counter-cultural attitudes among discipleship participants and MK volunteers. God is moving. We know God asks us to do things that are beyond our ability so that his glory can be known. We don't know how this will play out, but we believe this is where he is leading. We believe that he has counter-cultural plans for Kenyan orphans. Pray with us that God will move hearts in the Kenyan church, drawing his people to care for the orphans around them. (disclaimer: Be prepared for God to move your heart, too.) Pray that entire churches will make caring for their own orphans a priority, assisting relatives and caregivers of orphans, promoting foster care and adoption.